Increasing customer loyalty by just 5 percent can make your business 25 to 95 percent more profitable. Let’s take a closer look at the specific rewards they are looking for in a customer loyalty program. It shouldn’t come as a surprise that cash back is the most popular customer loyalty reward. Lest you worry about how that would impact your bottom line, remember that it’s the equivalent of giving the customer a gift card. When people redeem gift cards, 70 percent of them spend at least 20 percent more than the value of the gift card. So offering cash back as a customer loyalty perk could potentially increase bottom line revenues, not cut into them. 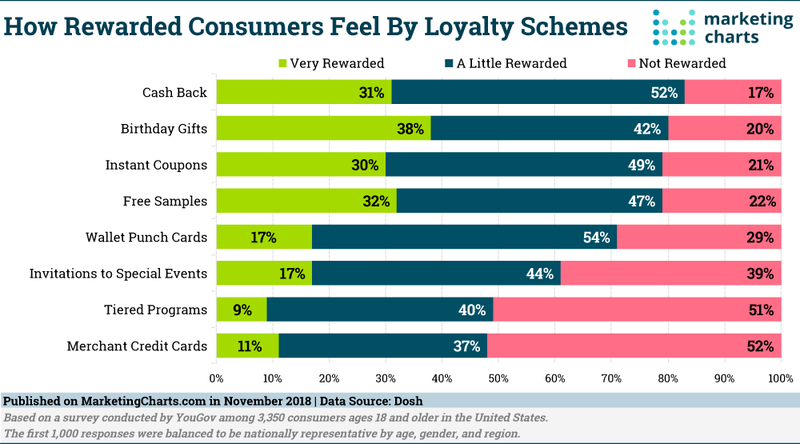 It’s worth noting here that while birthday gifts trail cash back when both “very” and “a little rewarded” are tallied together, birthday gifts have the highest overall score – 38 percent – when it comes to consumer sentiment. Extending birthday gifts as part of your customer loyalty program is also an easy way to personalize their reward. Without having to delve deep into a customer’s buying history, a customer’s birthday gift can come in the form of a gift card or cash back to spend in your store, and it can still be based on their purchases. Not only does this become a personal gift, it also encourages buying as it directly impacts the amount of reward earned. Instant coupons can mean instant gratification to a customer. 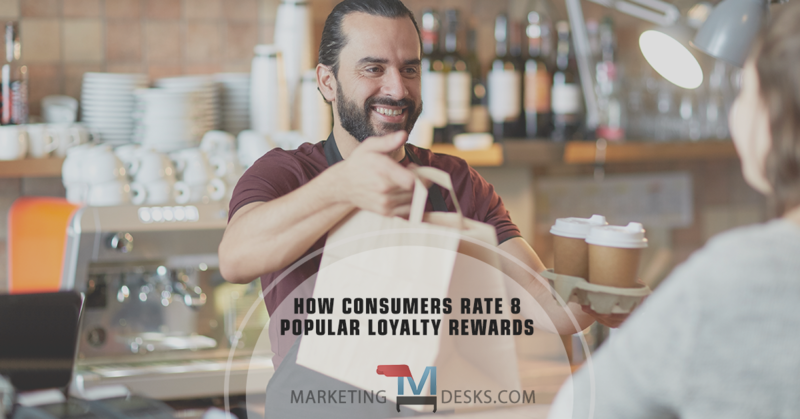 You can also tie these rewards directly to a customer’s purchasing habits, extending an instant coupon whenever they hit a tier (spend a certain amount at your business), when they make repeat purchases, when they come back at a higher frequency, etc. We all know people who go to Costco on the weekend because it’s free sample heaven. Like instant coupons, offering free samples as a customer loyalty perk can be a “surprise and delight” moment in the customer experience. It can also be used to stimulate sales of items a customer might not otherwise have purchased. Although this is often the first thing that comes to mind when you think of customer loyalty drivers, fewer than 1 in 5 say they feel ‘very rewarded’ with this loyalty marketing tactic. If a customer visits your business but can’t find their punch card, it can even create a negative customer experience. If you’re relying on punch cards to get customers to return again and again, make sure you have a way to give the customer credit whether they have their card with them or not. Tracking “punches” digitally instead can eliminate this problem and work seamlessly with your point-of-sale loyalty rewards software and email marketing. Digitizing your customer loyalty rewards and tying in email marketing automation gives you the ability to interact with customers in between visits, encourage them to return, extend double-punch and other enticements. Pay attention to the “not” number here. 4 out of 10 consumers don’t feel rewarded when you invite them to a special event. 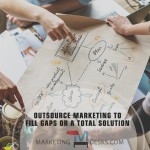 If you’re using special events as a customer loyalty tactic, consider giving customers the ability to choose a different option if this is not something they would value. Worth noting that we’re officially in negative territory here; meaning, using a tiered program could actually turn off more customers than it inspires to return. Self-explanatory. A merchant credit card is in itself a money-making product. It can also be seen negatively for that reason. Customer loyalty reward survey take-away: Make it easy. Cash back is easy. It’s easy to understand and it’s easy to use. 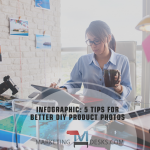 Basing cash back, birthday gifts, instant coupons and freebies on a customer’s total purchases is something you can probably manage with a robust digital point-of-sale software program. Easy for the customer and easy for your business.